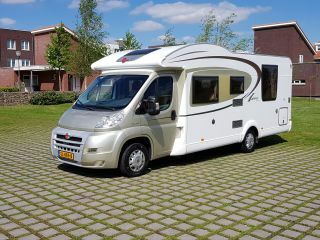 Luxury camper AUTOMATIC for up to 4 people. Car kit, cruise control, air conditioning and parking sensors. Twin beds, with extra mattress to build up to two meters wide double bed. The second double bed drops down electrically above the seating area. The car is equipped with TV, satellite dish, large fridge with freezing compartment, solar panel, reversing driving camera, shower, toilet, bike carrier for three bicycles and a very large garage, where three more bicycles could be used. The Camper also has an awning of 2.50 meters and an electric step to walk in. All window and door openings are equipped with a screen and blackout curtain. At least 5 years in possession of a valid driving license B. We ask the driver for a copy of his / her driving license and passport. If the camper is also controlled by other passengers, they must also provide a copy of the driving license. The camper is delivered to you both inside and out. If the camper is returned, it must be cleaned inside, the outside we do ourselves. The dirty water tank must be empty and the toilet cassette must be empty and cleaned. If you do not comply with the cleaning rules, we are obliged to withhold € 100 from the deposit. The car is delivered with a full tank of diesel and must be full again when returning. The car is supplied with a connected gas tank and a non-connected full gas tank. So the car must also come back. Response from Robert Leuk te lezen Jan Willem, Ik ben blij dat jullie genoten hebben!